[youtube]http://www.youtube.com/watch?v=j8KtbkGdogo[/youtube]The rise in unemployment in over 500 people in Águilas during the last 365 days uncovers the lie of the Popular Party and sheds light on their lack of sensitivity when it comes to health, educational and social policies. The spokeswoman of the Local Socialist Group on the town council, Mari Carmen Moreno, evaluates the first year of the current term in opposition. Mari Carmen Moreno began her speech before the media by highlighting that ‘more than 3,500 Águilas citizens are unemployed. This is the result of the disastrous policies of the new local government headed by Bartolomé Hernández’. The socialist leader stated that this piece of information was just one among the many that Hernández conveniently forgot in his assessment of this term’s first year. ‘The mayor stated that they had done a good job and painted an idyllic picture of the town, disguising their own failure as success, giving himself a B and an A to all his town councillors – two of whom were already in the previous government. However, from our point of view, they deserve a fail’. Furthermore, she stated that he is not the mayor that our town needs nowadays. His bad financial management will go down in history as the inexistent austerity programme shows. Such programme is essential in times like these. ‘Imagination is not enough, as the mayor wrongly points out’, Moreno asserted. She went on to blame Hernández for disguising as success the ‘impending’ remodelling of the Placetón, as well as the slow progress in the works of the Casa de la Cultura (Cultural Centre) and its library, and for leaving out that two town councillors in his current government are responsible for the wrong decisions taken on these sites. Besides, Moreno added that the mayor ‘shouldn’t boast about what he’s going to undertake which should already be up and running for the citizens to enjoy, a cunning way of disguising failure as success’. The socialist spokeswoman also denounced the serious problems faced by the Auditorio y Palacio de Congresos – publicly acknowledged by the mayor – and said that ‘this is but another outrage on the part of his fellow party members whose only aim was to have their picture taken at a time when local elections were nearing’. Moreover, Moreno regretted that Hernández mentioned only in passing the debt of nearly €2,000,000 that the Autonomous Region run by Valcárcel owes the town. ‘He failed to remember that the regional president belongs to his own ranks in the Popular Party’. Furthermore, Hernández brags about having fewer councillors this term, which is false, since he has got one more. He also omits the fact that the budget allocated for their salaries exceeds the previous one in €50,000 a year. Apart from this, Mari Carmen Moreno stated that she did not understand why the mayor can boast that a clean town is the base of tourism, when the citizens can see for themselves daily which areas are cleaned and which are not. ‘Is the monthly salary of the councillor responsible for this area, which amounts to €2,300 gross, justified?, she wondered. As far as health is concerned, Moreno was highly critical of the Popular Party’s job due to the closure of both our town’s health centres from 3 p.m. onwards every day during July and August. ‘A mayor must never underestimate the consequences of this mistake, as he did at the press conference.’ And she added that ‘of the 17 centres which are closing in the evenings this summer along the coast of Murcia, two are located in our town’. ‘This is one more incentive for tourists… undoubtedly, it seems that voting for the Popular Party seriously damages your health…’. Moreover, as Moreno highlighted, Hernández failed to remember his party’s broken promises such as the construction of a hospital, the introduction of more medical specialities or the increase of working hours (24/7) of the radiology service. Moreno talked about the work carried out by the Local Socialist Group in this term’s first year. She pointed out that approximately fifty proposals have been put forward, including motions, requests and questions during the ten plenary sessions held so far. She highlighted some of the most relevant ones, which were nonetheless rejected by the Popular Party, ‘this goes to show the true face of this government’. With respect to health, ‘we have defended the Public Health System, the preservation of the Clinical Laboratory and the opening of both health centres in town from 3 p.m. during the summer; the latter will be debated this coming Thursday’. About education, another mainstay of the social welfare state, ‘we have fought to avoid the cuts enforced by the regional and national governments. We also denounce the withdrawal of several routes of school transport and the closure of the Centre for the Conciliation Between Work and Family Life’. About infrastructures, ‘our goal has been to know about the progress of the repairs around the town, some of them left unfinished for years. We are referring to the Placetón, the Cultural Centre, the library, the Auditorium, the Sports Hall and the creation of new bicycle lanes’. We have also proposed a supervision of the town hall’s employees’ jobs, as well as a Farmer’s Office, the creation of a Local Farming Board and the regulations for the Trade Board. Another of our constant battles this year has been to supervise and hold the local government accountable for the cleaning of the town and this will, no doubt, continue to be a struggle in the future. Mari Carmen Moreno concluded by telling the citizens that ‘from the opposition, we’ll always be willing to help and try to solve all those problems we are presented with. We have done so with all our initiatives. Do not hesitate to let us know when a problem arises in your neighbourhoods, whether it may be street lighting or furniture, cleaning, signposting, etc. We have been working to this end this year through the various requests and questions put forward to the local government. It has been our duty ever since we were voted at the last local elections’. To our minds, Bartolomé Hernández does not fool anyone any more. We all know he is frittering away the remaining savings of the town council. Instead of creating new industries, they are being destroyed. The trade in Águilas is collapsing. The mayor does not disapprove of the cuts in health care and education, when he should be defending his town. On the contrary, he welcomes and justifies them. During his public speech, he seemed to ignore the sad reality of Águilas. Focused on you was their slogan in the last local elections. 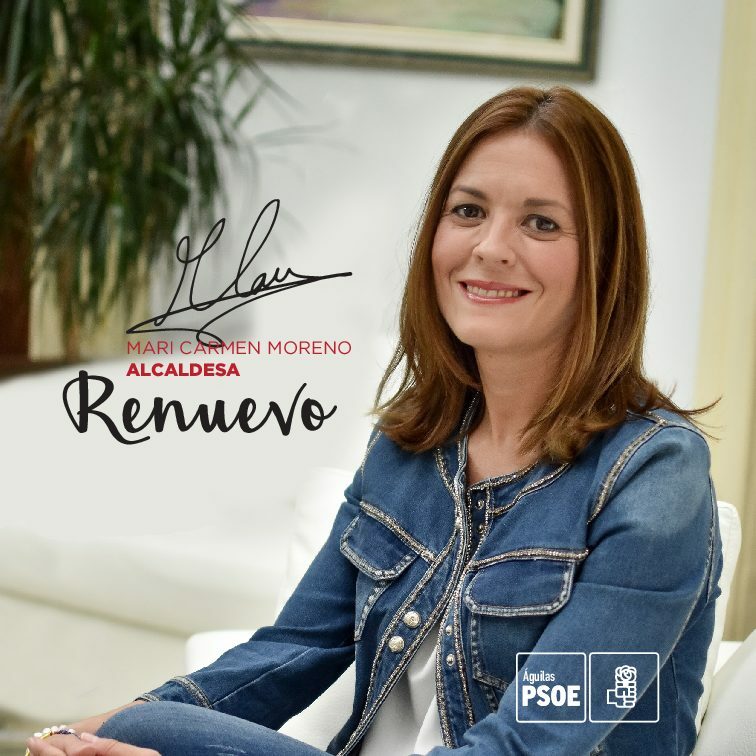 ‘At the Local Socialist Group we are convinced that, in this first year, the Popular Party have only been focused on themselves, on self-praise and on failing to fulfil their promises’, Moreno concluded.